Winnipeg was founded on the fur trade and wheat farming. We still have the Hudson's Bay Company and we most definitely are still known for our wheat. All kinds of grain is grown around the City of Winnipeg. It also has major pork, beef, chicken and dairy farms. We also have fantastic berries like blueberries, strawberries, saskatoons, chokecherries, raspberries... many growing wild across the province. 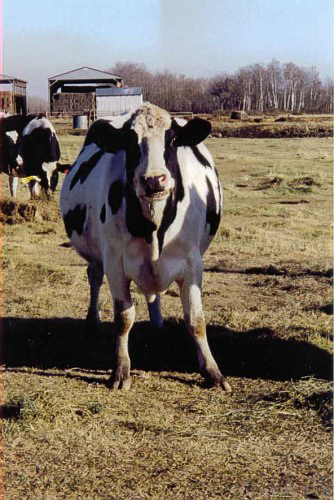 A cow who knows how to pose for the camera. You know that Canola oil that is used all over the world? That was developed in Winnipeg at the University of Manitoba. It was derived from rapeseed to make it safe for human consumption and then they changed the name so make is sound less creepy. "Canola" comes from Canadian Oil Low Acid. 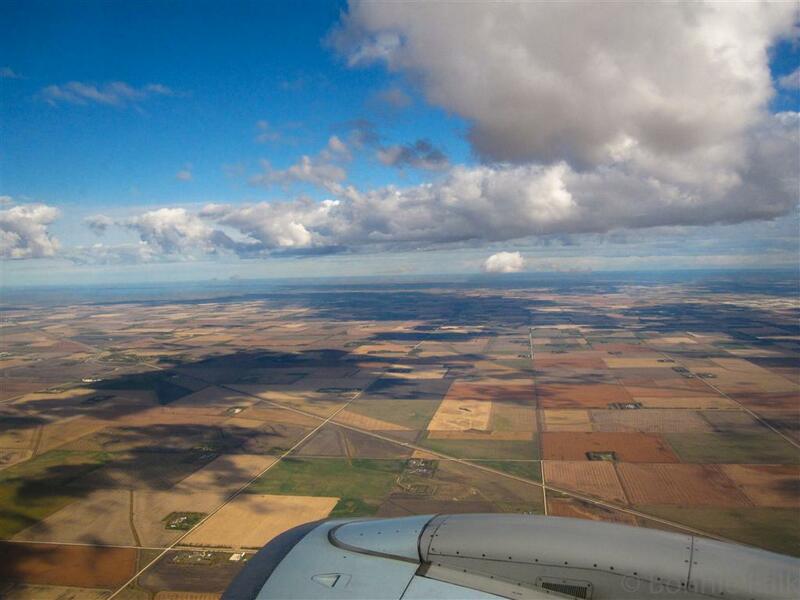 Patchwork of fields just West of Winnipeg. 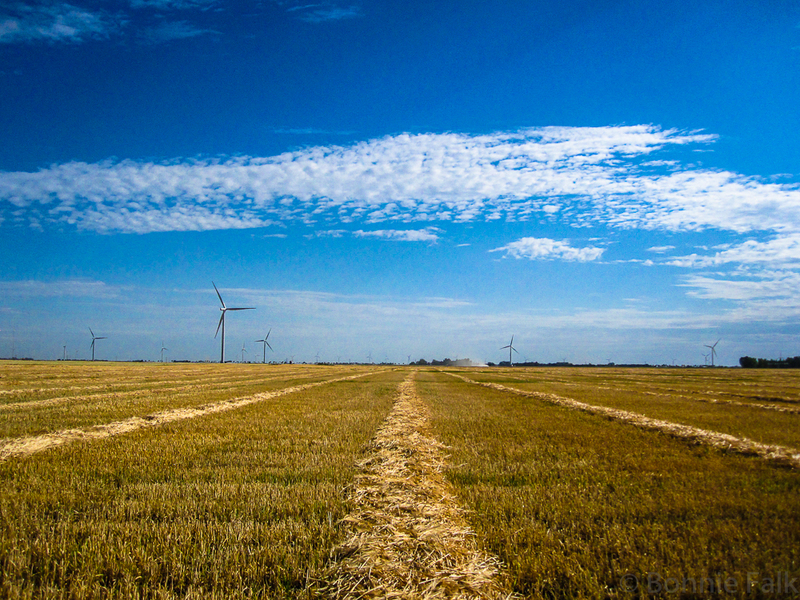 The Prairies are considered the bread basket of North America. Lots of agribusiness. Davao is the Durian Capital of the Philippines. 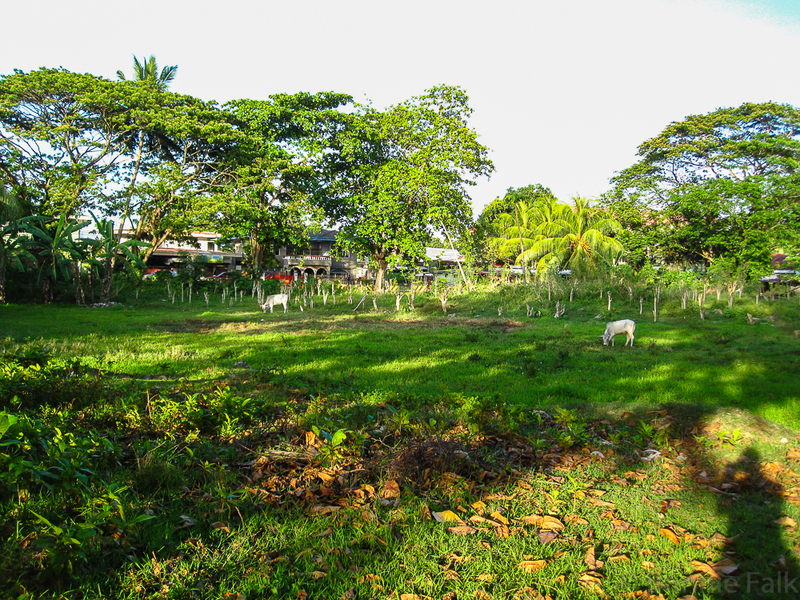 Whereas the growing season around Winnipeg is very short and intense, Davao has lush flora year-round. 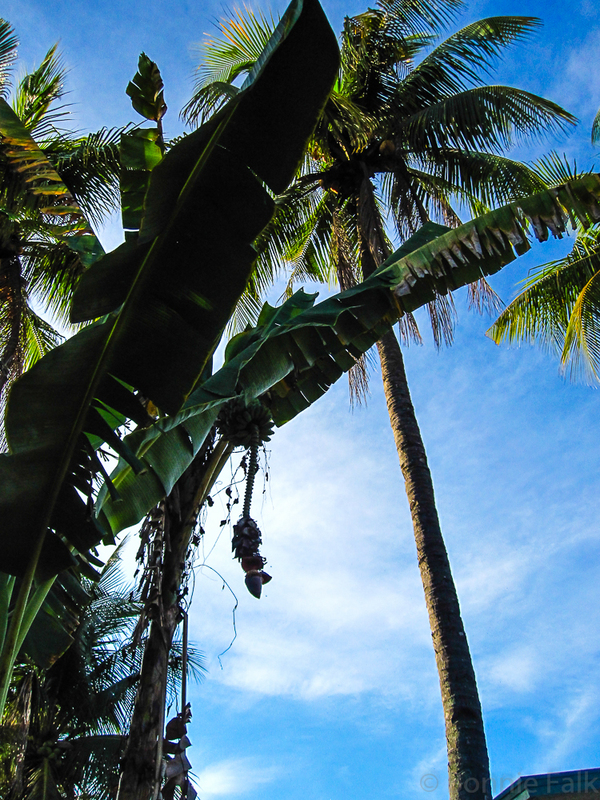 Banana and coconut trees in my neighbourhood. There is a lot of pork and chicken but beef is mostly imported. Fish is a huge thing here. At slightly higher elevations, near Mt. Apo, there are farms that grow more moderate-climate produce as well. This gives us nice variety but non-native items are still quite pricey. 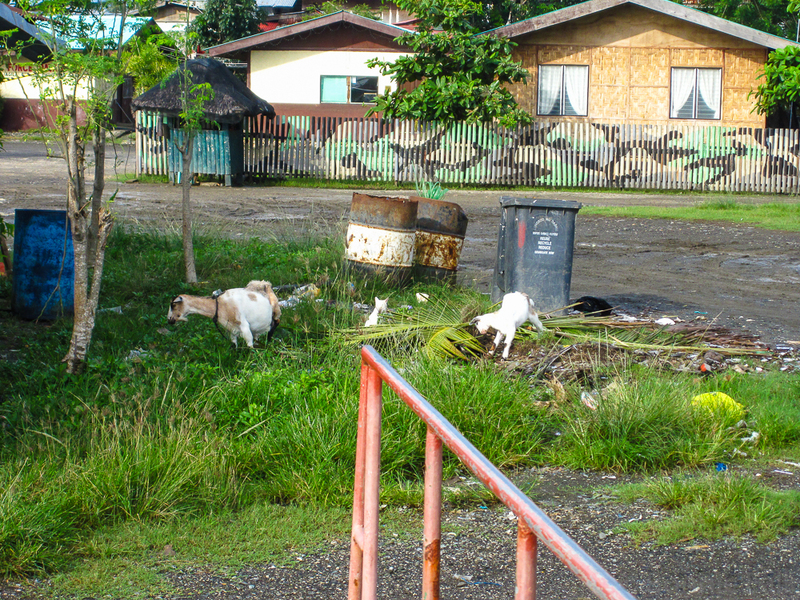 Goats out by the Santa Ana Wharf. Both cities have a lot of agriculture in the area, but the biggest difference in my opinion is that in Davao, it doesn't stay rural. There are cattle and goats in nearly every unclaimed green space, half the private houses have a few chickens running around and fruit trees grow all throughout the city and are fair game for anyone to harvest. An open green space in my neighbourhood. I like the contrasts between the places. The tropical ambience of Davao if more familiar to me but I like the wide skies of Winnipeg as well. What are chokecherries? I didn't know that about Canola. Chokecherries are very small berries that turn deep red/purple when ripe. These trees grow wild across Manitoba. They are extremely tart but make the BEST jelly! I only learned that Canola was developed in Winnipeg in the last year or so and I grew up there! Always fun to learn something new! Thanks Bonnie...they must have something in them that helps them to 'jellify', or perhaps it's just the taste. I didn't know that about canola. I just assumed there was some canola plants that the seeds were taken from. Shows what I know. Welcome to the challenge, Brett! Thanks for hopping by. Hello Bonnie, I'm stopping in from AZ. You might just be surprised! It has been fun trying to think of things alphabetically that they do have in common. Lovely picture.Good luck with the challenge! I participated last year and had a blast! Great photos and fun information. I had no idea where the word Canola came from. Interesting! I would love to have access to all that tropical fruit! Beautiful pictures! Loved the one of the cow! And I almost have to say the berries and bread would win out for me over the tropical fruit. I do love that cow picture, too. It is an actual film photograph that I scanned a couple of years back. :P And I do miss blueberries, especially. Hi Bonnie, hope I could see you when I go home. Davao is different fr my province (Central Luzon) instead of trees we grow crabs, fish and shrimp in our backyard:). I luv ur blog. If this is who I think it is, then I hope to see you, too! Fresh crab sound great! Thanks for leaving a comment! Beautiful photos and fun facts. I grew up on a dairy farm and love the agriculture. Thanks! I grew up in a small town across the street from dairy farmers! 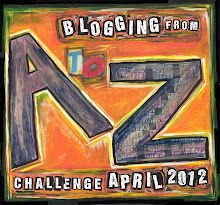 I just caught up with A to C. Very good idea for a theme! Thanks! It's been fun so far! What a change in location! I love Canada but have never been to Manitoba. Really must go one day. Never tried durian either--don't know if I want to.